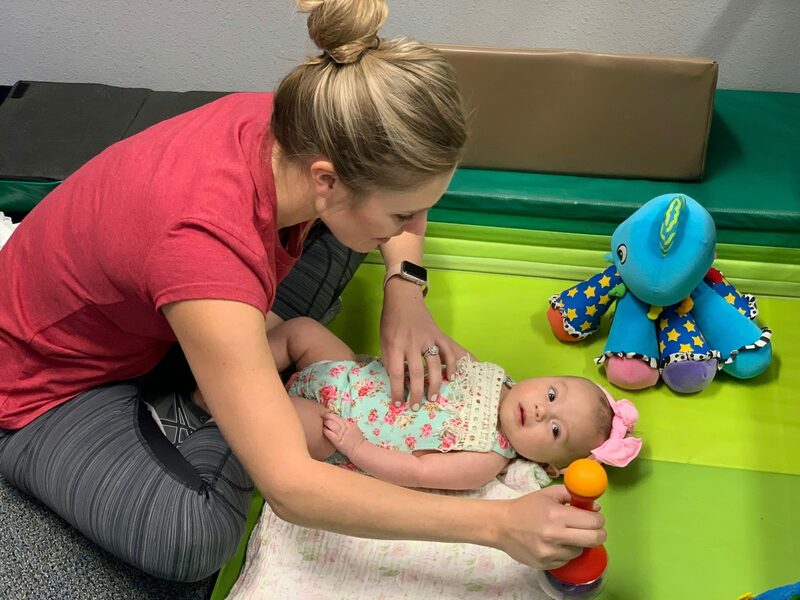 Continuing on our series “5 Ways to Play with Your Baby at Each Stage from 0-12 Months” is our fabulous Physical Therapist Lauren Yoshida sharing her ideas to encourage physical development through play. Present toys to your baby that are visually attractive, such as toys that make noise or that flash colors. Move the toy from side to side while your baby is laying on his/her back for visual tracking. Tummy time! While a baby is laying on his/her belly, hold a toy in front of them while slowly raising the toy off the surface to encourage your baby to lift his/her head higher off the surface while pushing on his/her arms. While on their tummy, bring their favorite toys from one side of their face to another to encourage them to turn their head to find the toy! Lots of little ones also love faces, so get down to their level and let them find mama/daddy’s face! Gently stroke the back of your baby’s hands to encourage the baby to open their hands from a closed/ fisted position. Have your baby lay on his/her back while you hold their favorite toy above their chest. Encourage your little one to reach for the toy with both hands. If they need help initiating the movement, gently brush the toy over their arms or assist with raising their arms to the toy. Place your baby on his/her tummy. Hold their favorite toy in front of their face and slowly raise it so it is out of reach. Encourage your baby to reach for the toy with one hand at a time, or alternating arms. Use your baby’s favorite toy to encourage your baby to roll from tummy to back and back to tummy. Begin by holding the toy over the baby’s chest while he/she is lying on their back. Move the toy to the right or left of them, just outside of reach. To help them roll to their tummy, bring one leg up and over the other one while you continue to move their favorite toy out of reach and to continue to draw their attention over to the side and up. Support your baby, while allowing their feet to touch the floor in order to stand up tall or bounce. Again, babies love faces! Hold them so they are at your face level while they bounce and hold their weight on their legs. This is a perfect time to sing their favorite song! Place your baby in a supported ring sitting position by propping himself/herself up with both arms. Place their favorite toy in front of them so it draws their attention forward. Baby sit-ups! Place baby on his/her back and place your index fingers in each of his/her palms so he/she grasps onto your fingers. Begin to pull them up into a sitting position, while encouraging him/her to pull himself/herself up without your help. Help your baby get into sitting! Hold up a toy off the ground, but in front of your baby. Use his/her hips to help them up from a lying down position. You can also help them from underneath their arm when extra help is needed. While in a sitting position, bring his/her favorite toys off the ground and encourage your little one to reach up with one or both hands to get the toy. Hands and knees time! Help your kiddo get into a hands and knees position by supporting them at the hip, or belly if they cannot hold themselves up with their arms. Encourage them to start crawling! While on their hands and knees, place their favorite toy out of reach so they are encouraged to crawl! Up, Up, Up! Place your baby on their feet while holding onto a stable surface. Place your baby’s favorite toys on the solid surface so they can play while standing up! Place your baby’s favorite toys up on a supportive surface that your baby can pull up on. Encourage him/her to crawl to the surface and pull to stand to play with a toy with you! Once your baby is up on their feet while holding onto a surface, move the toy to the right or left just outside of reach! Encourage them to take steps to reach the toy and keep playing with you! Start walking! Hold both of your baby’s hands and encourage them to take steps. Placing objects into a container. While you little one is in the sitting position, place small objects such as puff balls, buttons, Legos, etc. in front of them as well as a cup or bowl to place the object in. Help your kiddo place the object into the cup or bowl! Standing alone now! Place your baby in a standing position and slowly let go of their hands. Little ones love to see how happy standing makes you so make sure your cheer them on! 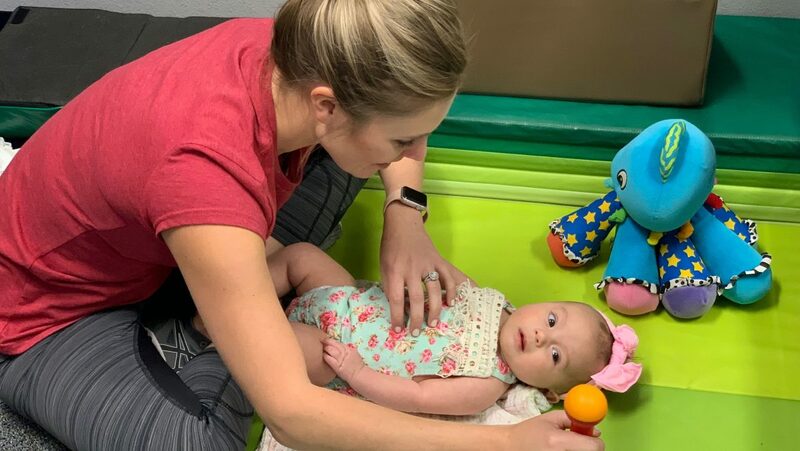 If you have any questions about your child’s development please call T.E.A.M 4 Kids to schedule an evaluation at our Surprise or Peoria locations.